Film is one of the most powerful forms of artistic expression, so much so that the art of film is celebrated all over the world. In Leavenworth, WA, one of these celebrations of artistic filmmaking is the Vox Docs Film Festival, an annual tradition that highlights some of the most beautiful and thought-provoking documentaries made in the most recent year. If you are a lover of all things film or looking for something fun and interesting to do during your stay with us at Pine River Ranch, then you’ll definitely want to mark this event into your calendar. Here’s what you can expect at this year’s Vox Docs Film Festival, and don’t forget to claim your free copy of our Leavenworth Vacation Guide to find even more local events, activities, attractions, and more to enjoy during your stay. Download Your Free Guide to Leavenworth, WA Right Now! The Vox Docs Film Festival was founded in 2001 with the goal of celebrating culture, encouraging discussion, and bringing artistic expression to the Leavenworth community. The annual event is hosted by the Icicle Creek Center For the Arts and welcomes people from all walks of life to come together and experience award-winning documentaries that tell stories of inspiration, hope, and social change. Now in its eighth year, the Vox Docs Film Festival is scheduled for March 1st-2nd, 2019 and will boast an impressive lineup of emotionally moving films. Here are just a handful of documentaries you can look forward to at this year’s event. Miss Veedol: Exploring the impact of first trans-pacific flight from Japan to East Wenatchee, from Voortex Productions. Not For Any Price: Covers the Lumi Nations’ fight to preserve sacred hunting grounds, from North 40 Productions. The Winter’s Tale: This professionally made student documentary captures the Wenatchee Tribal creation legends of dragon Spexman, the guardian of the Columbia River. Free Solo: A stunning, intimate and unflinching portrait of the free soloist climber, Alex Honnold, as he prepares to achieve his lifelong dream, which is climbing the face of El Capitan in Yosemite National Park … without a rope. This film is an Oscar nominee! Tickets to the 8th Annual Vox Docs Film Festival will be available soon! Don’t Forget the Leavenworth Mountain Film Festival! Can’t get enough film festivals? Then we have great news for you! The Leavenworth Mountain Film Festival is another must-see event and showcases some of the best recent films with an emphasis on outdoor pursuits. Attendees of this film festival will be invited to dress up in their very best dresses or suits, take a complimentary limousine ride to the venue, and walk the red carpet themselves before viewing spectacular short films. You’ll be sure to feel like royalty! This year’s Leavenworth Mountain Film Festival is set for April 5th-6th, 2019, so be sure to get your tickets today! Need a Place to Stay For These Film Festivals? Look No Further Than Pine River Ranch! Located amidst Washington’s spectacular Cascade Mountains, our historic bed and breakfast and wedding venue is everything you’ve been looking for in a romantic and memorable getaway to Leavenworth. Guests to our inn are spoiled with warm hospitality, a wide variety of luxury amenities, and of course, gorgeous suites that perfectly exude the romantic setting that you’re looking for. 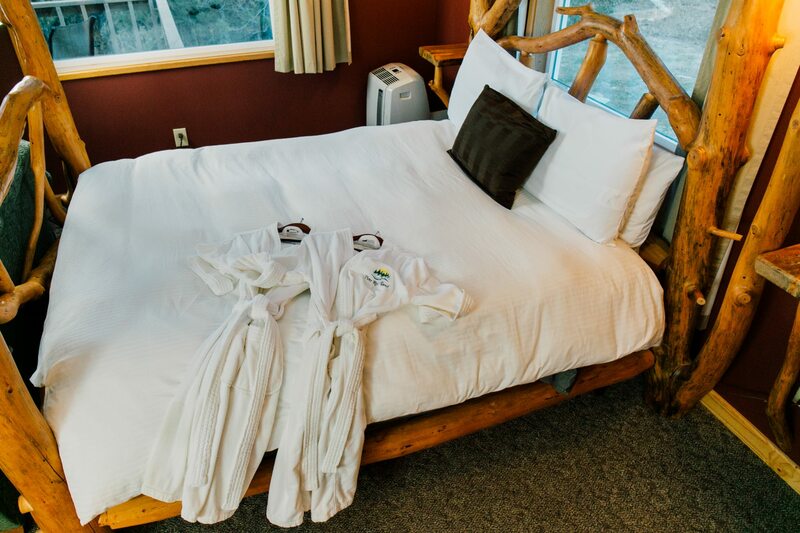 The Natapoc Suite is one of our most popular accommodations and is the perfect place to retire after a full day of Leavenworth adventures. Since it is located the furthest from the Main House, you and your sweetheart can look forward to ultimate privacy along with cozy amenities such as a real-rock propane fireplace for warming up on those chilly nights, an in-room jetted tub, a gorgeous pine log bed, and more. When you awake in the morning, a piping hot gourmet breakfast will be delivered straight to your door. That way, you can relax with a delicious morning meal before embarking on your next adventure! Check our availability today and be sure to book your next getaway soon! We look forward to welcoming you to Leavenworth.